A mallet finger is a very painful, and often very debilitating, injury that involves the tip of the finger. The injury occurs when an object, such as a ball, hits the player on the tip of the finger. It involves the extensor tendon, which is the tendon that extends the tip of the finger, being pulled off of the distal phalanx, or the bone at the tip of the finger. The tendon can be pulled off of the bone by itself, or it can pull a small piece of bone off the main bone. Usually examining the injured finger is enough to make the diagnosis. The player will usually show a finger where the tip is bent down somewhat, and he or she will have an inability to extend the finger out straight. The physician will usually order x-rays in order to determine if a small piece of bone was pulled off with the tendon and whether or not the distal phalanx lines up with the middle phalanx, which is the bone just below it. Treatment usually involves holding the tip of the finger out straight on a continuous basis for 6 to 8 weeks. This usually allows the tendon to heal in the correct position. 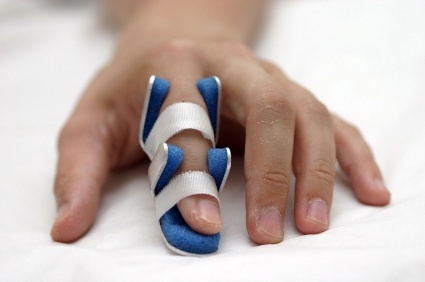 It’s important that the athlete keep the splint that holds the tip of the finger out straight on continuously, as any bending will disrupt the repair. If the bones don’t line up well, the surgeon may recommend treating the injury surgically, which involves putting a pin through both of the bones to hold the joint straight until it heals. If the athlete can play his or her sport in the splint, then return to sports is often fairly quick. Unfortunately, sports that involve throwing or other hand activities can often be adversely affected. If surgery is required, the athlete might be out of sports for several weeks to several months depending on the length of time that the surgeon needs the pin to stay in place.